In the post-Weinstein era it’s easy to jump to conclusions when you see a couple of guys either side of 60 submit an application for a team with two women in their mid-twenties. The time it took us to go from “Eew” to marching in the streets was only slowed because we’re bad at knitting and we ran out of pink yarn for the hats. In between instinctive moral outrage and yarn store we took the time to actually read the thing—it’s ok. Family thing: father, daughter, and a couple friends of the family; one older, one younger. Hit pause on the tweets and the lawsuits, holster your Bobbitt shears. Stand down, stand down! Ironically, while they may have almost been the false scandal of our own capricious invention, Team Ptarmigan is anything but capricious. They’ve studied the race. Before they entered, they watched, they learned, they even embedded themselves as volunteers to get access to the teams and glean what knowledge they could from the collective wisdom of the racers. They even scored a deal to secure the rowing stations for an F28 that have made it to Ketchikan in every race. If you’re going to hitch your wagon to anything it might as well be a proven theory; a streak is a streak. They also secured a boat that according to research (or a hunch, but it feels true) is the design that has more successful finishes than any other boat in the history of the R2AK. 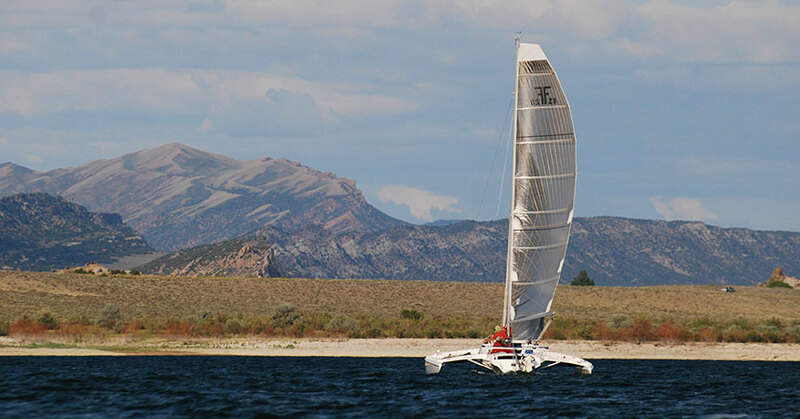 A trimaran that the Bohanon family has sailed extensively, and at least in the Mediterranean and the Sea of Cortez (if you can believe the tags on the photos). Put it all together and it starts to sound like a winning strategy: knowledge of the R2AK, the successful boat of record, completely non-creepy crew situation that carries the racing dreams of the great seafaring state of Colorado. Welcome to the R2AK, Team Ptarmigan, may you poop triumphant in Alaska and make Colorado proud.